Step 1: Decide whether you want to use a pre-designed template or not. Pre-designed business card templates typically already feature high-quality images and evenly spaced lines of text. And they make entering information rather simple. Read reviews and compare business card printing companies here. Step 2: Save your business card design with optimal image resolution. If you’re uploading your own design, make sure to save your file as CMYK (full color) with 300 DPI. This is the resolution accepted by most business card printing companies. If you’re uploading images to a business card template, it’s best to use the largest images you have, and then resize your photos in the online editor. This ensures that you’ll get better image quality when the card is printed. Moo suggests saving your files as RGB jpegs, at the maximum quality available. They also let you upload images directly to the online template editor; they suggest 1024×768 (from a 1 MegaPixel camera) for these. Step 3: Know the standard business card size. The standard dimensions for a printed cut business card are 3.5 x 2 inches. The “bleed area” extends 1/8 inch beyond the finished size of the card. This area is designated to give the feel that the printing “bleeds” off of the card instead of having a white border around the card. The “safe area,” “bleed area” and “trim area” should be marked, either on the online WYSIWYG editor or on the downloadable template. Avoid text and images that cross into the bleed/trim lines. If your template isn’t marked,don’t save any important information close to the edges of the card, as it will most like be cut off. Step 4: Make sure you are using a readable font size and font color. Avoid using text smaller than 10 pt, unless your font is in ALL CAPS or bolded. All of the text on your card should be about the same size. Your logo or company name should really be the only text that might be larger than the other information. Avoid putting light text on light backgrounds and dark text on dark backgrounds. Remember that a matte or laminated finish could dull your card, making the text harder to read. The same thing goes for a textured cardstock. Step 5: Save your company business card design in the correct file format. Most companies accept JPG/JPEG files. Moo accepts JPG, GIF, PNG and PSD files. 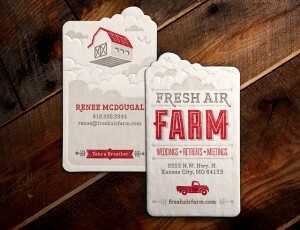 They also offer downloadable PSD (Photoshop) and JPEG business card templates. Uprinting accepts JPG, GIF, PNG or SVG files. They say, “the bigger the better” when it comes to image size. GreatFX accepts JPG, GIF and PNG files. VistaPrint accepts JPG, PDF, AI, PSD, BMP, GIF, PUB, DOC, DOCX, PNG, PCX, PIC, PS, EMF and WMF files. They also offer downloadable PSD (Photoshop) and AI (Adobe Illustrator) templates. iPrint accepts JPG, TIP and BMP files. They accept a maximum image file size of 5 MB and suggest that you upload an image that is the same size as the actual image you want to appear on the card. Andreoni accepts JPG, BMP, TIF, EPS, BMP, PSD, AI and CDR files. They also offer PSD (Photoshop) templates. When in doubt, ask the printing company. Moo, Andreoni and Uprinting are a few of the companies who will look at your business card design and correct errors or make suggestions. Now, you’re ready to upload and order your business cards! Read reviews and compare business card printing types.